Huang Yi (黄奕) attended the microfilm press conference held during the 15th Shanghai International Film Festival held on June 21, 2012 in Shanghai, China. 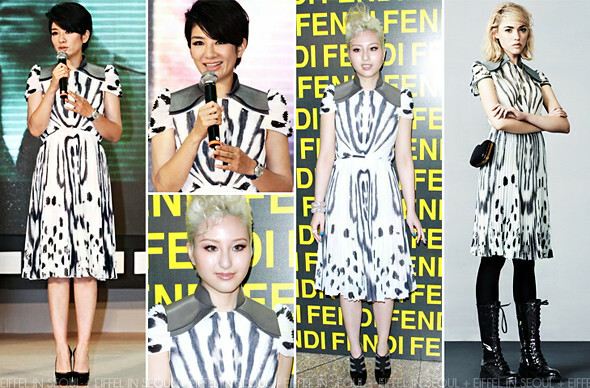 She wore a printed dress from Fendi Pre Fall 2012 collection with grey shoulder pads. A pair of black leather pumps from Christian Louboutin and a watch to accessorize her look. Florinda Ho (何超云) was also seen wearing the same dress to the 'The Whispered Italian Grand Tour' exhibition held two days later. She accessorized her look with a silver and gold bangle with a pair of black ankle boots. While I dislike both of their shoe choices, those boots on is simply horrendous.